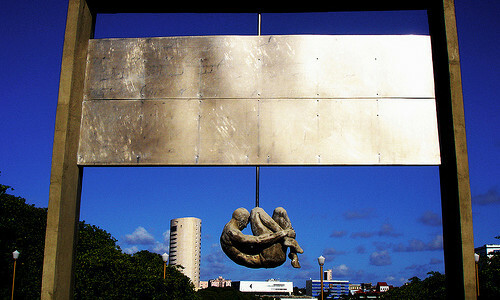 The Monument Tortura Nunca Mais (Torture Never Again Monument) in Recife, Brazil. It was built to honour the dead and disappeared of the Brazilian military dictatorship. How should historians of the ‘psy’ professions make sense of the dark realities and disturbing rumours of the past? The Hidden Persuaders project studies how the threat of ‘brainwashing’ influenced the practices and reputations of psy professionals. Below, Aline Rubin reminds us that there have been other harrowing points of intersection between psychoanalysis and political oppression, particularly in Latin America. Scholars of psychoanalysis have only begun to reckon with this challenging history. Many countries in Latin America present very vivid and vital psychoanalytic cultures. A high number of their psychoanalytic societies are affiliated to the International Psychoanalytical Association (IPA). Numerous analysts across the continent are developing original psychoanalytic work. In Brazil, the first lectures on psychoanalytic theory took place early, at the end of the nineteenth century, just as the psychoanalytic movement was beginning to emerge. Freud’s ideas had a rapid and pervasive impact on Latin American culture. In 1920, one of the most prominent writers of the time, Mário de Andrade cited psychoanalytic concepts; psychoanalytic practice was established in the general hospitals of Rio de Janeiro at the same period. It took a few decades for psychoanalysis to become fully institutionalised in Brazil. Due to its geographical distance from Europe, it was difficult to find IPA analysts to come to Brazil to start the local training. This began to change with the rise of Nazism, when many central European psychoanalysts, in fear of their lives, emigrated. Ernest Jones and other key figures in the psychoanalytic movement played a role in determining their destinations: the émigré analysts were sent all over the world, thereby spreading psychoanalysis across borders. After the Second World War, a reverse migration also occurred: many Brazilian analysts headed to Europe, although some moved less far than that, crossing the border to Argentina seeking training. By the time of the worst period of the Brazilian dictatorship (1968-1974), the country had four IPA-affiliated societies in the main urban centres: São Paulo, Rio 1 (Sociedade Psicanalítica do Rio de Janeiro) and Rio 2 (Sociedade Brasileira de Psicanálise do Rio de Janeiro) and, in the south, Porto Alegre. But if this account suggests a benign spread of liberal Freudian values, there is also a more sinister tale to be told about coercive persuasion, interrogation and torture in the annals of the Latin American psychoanalytical movement. The story we focus on here started with an anonymous letter. This was written by Helena Besserman Vianna, a trainee analyst at the Rio 2 Society. Her identity was uncovered after an investigation held by the Rio 1 Society. The letter was forwarded to Questionamos, a psychoanalytic journal in Argentina edited by the famous left-wing analyst, Marie Langer. This letter denounced several torturers in Rio de Janeiro, including Amilcar Lobo, an analyst in training at the Rio 1 Society. Amilcar Lobo was in medical school in 1968 when he was recruited by the army to be a military doctor. According to his accusers, his role was to monitor the condition of the detainees, thus to ensure the tortured remained alive in order to endure more pain and undergo further interrogation. These allegations soon spread and resulted in a demand from the IPA and COPAL (Psychoanalytic Confederation of Latin America) for clarification by the Rio 1 Society. The latter replied by denying the charges. In addition, Lobo’s training analyst, Leão Cabernite, a senior analyst in Rio, castigated the denouncement of Lobo as entirely false, even though, as subsequently became clear, he knew about Lobo’s activities. The IPA president Serge Lebovici accepted these denials of any wrongdoing by Lobo. No further investigation was undertaken at that point. This story remained underground for almost a decade afterwards and only came fully to light when the political repression was lifted, and some people who had previously been tortured could finally speak out. 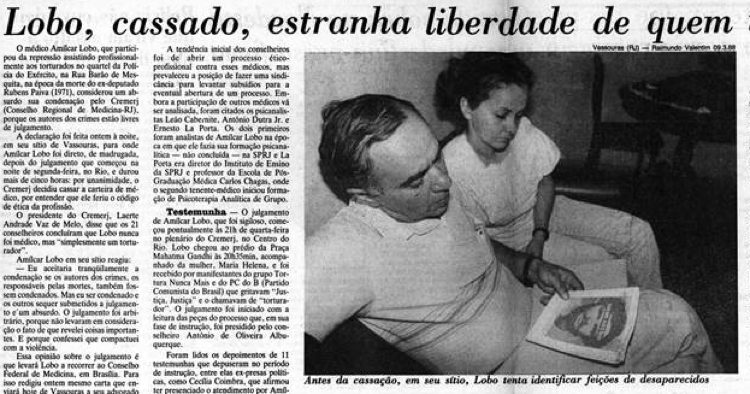 By the end of the 1980s, Amilcar Lobo had become a public figure, often appearing in the main newspapers of the country giving interviews and trying to justify his actions during the dictatorship. 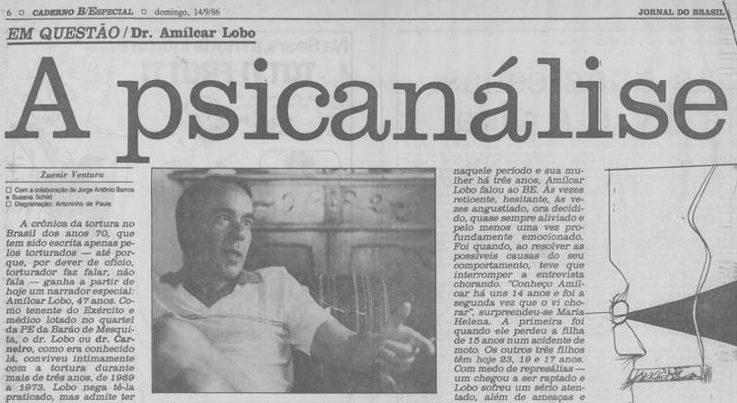 Amilcar Lobo being interviewed by the main Brazilian newspapers in the 1980s. The public revelation of this case triggered a major crisis in the Rio 1 society. It was accused by some psychoanalysts of covering up participation in torture and repression under the guise of neutrality and ‘safeguarding psychoanalysis’. This resulted in a belated intervention from the IPA, which sent a committee to undertake a site visit in order to examine the situation. The committee, chaired by Robert Wallerstein and accompanied by Hanna Segal and Ramon Ganzarain, visited Rio 1 in December 1982 in order to ensure its proper functioning, set new guidelines for the selection and training of candidates, and reformulate some of its ethical and institutional rules. However, even after this visit not much happened and Cabernite in particular continued to have a great deal of influence within the Rio 1 Society. In 1989, Amilcar Lobo published a book, The Time of the Wolf, the Time of the Lamb, with the aim of relating his experiences as a military doctor. On the first page, he cited Ingmar Bergman and provided the following quotation from the Swedish director: “The wolf time is when most people die, when the sleep is deeper and the nightmare the worst. It is the time when the wakeful is hunted by his worst anxieties, when the goths and demons are most impressive. The time of the wolf is also the time when the children are born.” He claims to have written the book as a way of facing his painful past. After his death, his wife gave interviews to newspapers asserting that Amilcar Lobo was used as a “scapegoat” for the evil of repression, and that he was only a doctor coerced into undertaking a job under risk of death or imprisonment should he have refused. 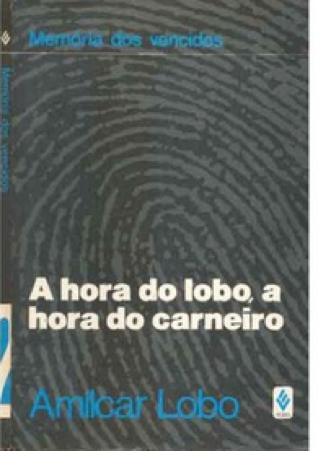 Cover of the book “The time of the wolf, the time of the lamb” by Amilcar lobo. This whole episode was documented in detail by Helena Besserman Vianna (1994) in her book Don’t Tell a Soul: the Confrontation of Psychoanalysis with Torture and Dictatorship. The title was inspired by a request by the IPA vice-president in 1993 that the author, who was in some ways herself a victim of the affair (her career was blocked), should not talk about this subject any more. It was translated into French in 1996 and Spanish in 1998. Curiously, it has not appeared in English. Much has been written hitherto about the difficulty the German psychoanalytic community faced, post-war in facing up to the history of its involvement with Nazism. An honest reckoning with that past took many decades. Denial and disavowal were rife for years. Likewise, it has taken a great deal for the psychoanalytic movement in Brazil to begin to open its “black box” and face its past and the events and cover-ups that took place during the dictatorship. This is still a subject that has been too little discussed in an open way within Latin American psychoanalytic societies. In the last 30 years the subject of the history of psychoanalysis in Brazil has been largely studied inside the universities as well as independently and individually by a variety of historians, psychoanalysts, psychologists and other professionals. Aline Rubin is a doctoral candidate at the University of São Paulo, Brazil, and a graduate from the MA in Psychoanalytic Studies at Birkbeck College. She is working with Professor Stephen Frosh (Birkbeck) and Professor Belinda Mandelbaum (University of São Paulo) on the history of psychoanalysis in Brazil during the dictatorship. This blog provides a thumbnail sketch of the Lobo affair and ensuing events. To learn more about the episode and its aftermath described here see Rubin, A., Mandelbaum, B. and Frosh, S. (2016), ‘No memory, no desire: psychoanalysis in Brazil during repressive times.’ Psychoanalysis and History 18 (1), pp. 93-118.